You have 1189 characters. Don’t forget to add important and relevant keywords in your description to improve your iTunes app page and optimize your SEO. Your app's last version was released on October 29, 2009. It is important to regularly update your app. Best practices recommend to update your app every 4 to 6 weeks. This means fixing reported bugs, improving existing features, launching new features etc. Keep an eye on users' feedback. The next great features may already be asked by many users. Don't playing with a tiny gun. Real gun is must able to pull the trigger with one hand. 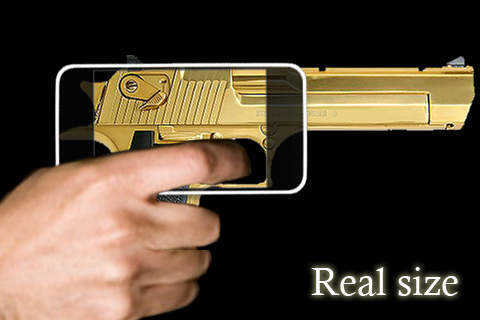 AAA rgDesert Eagle is a realistic hand gun simulator for iPhone and iPod Touch. This is NOT just a sound generator, but an interactive realistic rgDesert Eagle 50AE simulator. AAA rgDesert Eagle is similar to the actual size. If you want to actual size gun? Download AAA rgDesert Eagle 50AE and shoot'em up!! - A Realistic bubble wrap : BubblePop! - Airline Conqueror : path-drawing airplane control game.